Stimulant drugs have been shown to enhance the control over behaviour exerted by stimuli previously correlated with primary reinforcers, termed conditioned reinforcers (CR). Experiment 1 examined the possible neuroanatomical specificity of the enhancement of conditioned reinforcement following intracerebral injections ofd-amphetamine. Thirsty rats were trained to associate, a light with water. In the test phase, water was no longer presented but the light (CR) was intermittently produced by responding on one of two novel levers. Rats with bilateral guide cannulae aimed at the nucleus accumbens, posterior caudate nucleus, or medio-dorsal nucleus of the thalamus received four counterbalanced microinfusions ofd-amphetamine (10, 20, 30 μg/2 μl) or vehicle (control) over 4 test days. There was a dose-dependent selective increase in responding on the lever that produced the light (CR) with intra-accumbensd-amphetamine infusions. Quantitatively similar, but much more variable effects were found with intra-caudate infusions and no effects following intra-thalamicd-amphetamine. 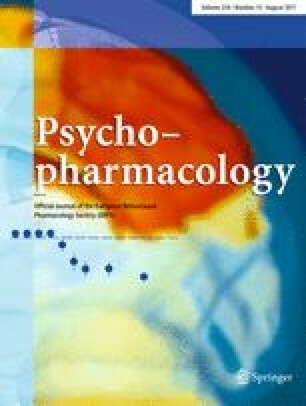 Experiment 2 provided evidence that the enhanced control over responding by a CR with intra-accumbensd-amphetamine is behaviourally specific. Three groups of rats received a compound tone — plus —light stimulus that was positively, negatively or randomly correlated with water during training. Intra-accumbensd-amphetamine produced selective increases in responding only if the contingent stimulus had been positively correlated. The results suggest that the nucleus accumbens may play an important role ind-amphetamine's enhanced control over behaviour exerted by conditioned reinforcers.